The directors of Summit Lake are developing a new Bible conference center called Middle Creek Bible Conference. It is located near Fairfield, PA, just over the Mason Dixon line and a stone’s throw away from Gettysburg battlefields. In the early stages of development, Middle Creek offers a Tabernacle, which serves as meeting space and dining facilities for over 200 people, and two lodge, which accommodate 30 (the Manor) and over 50 overnight guests (Laney Lodge). Plans are to build enough lodges to sleep 1200. Click here for more info and pictures. In 1969 a fully built youth camp near Emmitsburg, MD, was acquired & incorporated as Summit Lake Bible Conference. Many volunteers donated time to winterize what had been only a summer camp. Three lodges were built, & a tabernacle & chapel were added. Other planned lodges were denied permits because of zoning, so additional space for expansion had to be found elsewhere, resulting in the search for & subsequent purchase of the Middle Creek property in 1983. 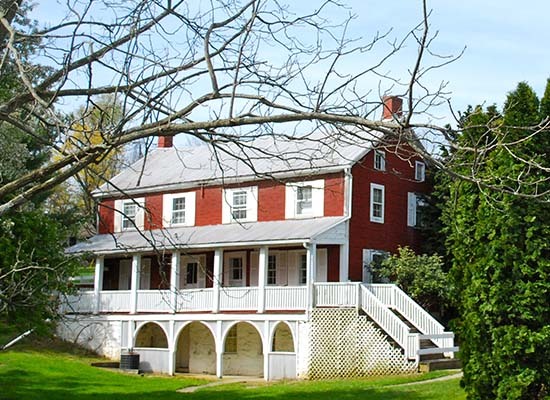 The PA site is only 20 minutes from Summit Lake, & 15 minutes from Ski Liberty & Gettysburg. The purpose of Middle Creek Bible Conference is to assist the Christian church with a facility to augment the work of carrying out the Great Commission of our Lord Jesus Christ. Middle Creek seeks to provide quality accommodations in a secluded atmosphere in the midst of His beautiful creation where worship, praise, contemplation, study, teaching & preaching will edify His people. Recreational activities enhance the spiritual experience of God’s people as they grow in grace & knowledge of the Lord. In the summer the staff of Middle Creek conduct Bible Conferences featuring able Bible expositors of all evangelical denominations. All activities are centered around the inspired, inerrant Word of God which provides us with direction in all matters of faith & practice. The best support Middle Creek can receive is through your prayers. Please pray with us for the completion of Middle Creek Bible Center, & that through it, souls are reached for Christ. After all, that’s what we’re here for. Contact us to schedule a tour or for more information to see if our facilities are right for your group. Middle Creek is a $30 million project. The Board of Directors has begun construction of the initial $10 million phase. It will be completed & new stages will be added as funds become available. Donations, which are tax deductible, should be made out to Middle Creek Bible Conference, Inc.